Update from Vancouver Aquarium Marine Mammal Rescue Centre. Yesterday was a big day for Chester, the false killer whale calf currently under care at the Vancouver Aquarium Marine Mammal Rescue Centre. 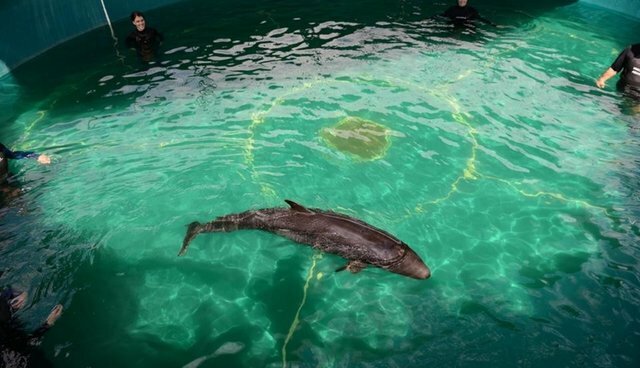 He was transferred to the larger pool at the Rescue Centre, facilitating his ability to swim faster and dive deeper, which are important activities for his muscle development. Chester is fed every 1.5 hours and has been slowly gaining strength and weight, he is now 102 kg. He eats a mixed fish formula and is offered whole herring at some feeds with the goal of weaning him off formula and onto fish now that his teeth are coming in. He continues to develop vocalizations and makes a series of different clicks and squeals which are audible to the human ear. We have a hydrophone in the water and are recording these vocalization for researchers. Chester remains under 24/7 watch and is still in critical condition, but we are cautiously optimistic for his future. I just only want to know one thing what will be Chester FUTURE? Will it be CAPTIVITY? WILL IT BE HIS FREEDOM - ABSOLUTELY YES HE HAS TO BE RETURNED TO THE WILD.